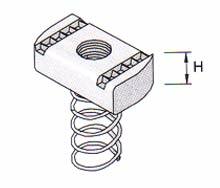 We provide a vast collection of extremely sturdy Spring Channel Nuts that is exactly intended to give outstanding handling power. Simple to fit, our Steel Channel Nuts are exceedingly sturdy and consistent and are made in the premium superiority from Stainless Steel. Customers can get it at most reasonable costs. These nuts are cold pushed, spouted so that their teeth will offer a "BITING" act into the in twisted rims of channel parts. 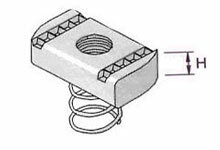 The nut bodies are intended with beveled finish which bolts into location by contact with inner side barriers of channel when twisted at 90 degree. The channel nuts are as well accessible in SS304 and SS316 marks in brilliant end. 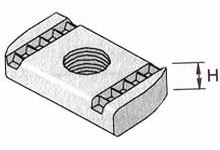 Material: The channel nuts are cold pressed, tapped so that their teeth will provide a "BITING" action into the in turned edges of channel sections. 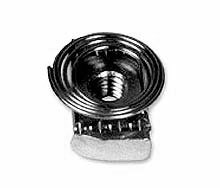 The nut bodies are designed with beveled end which lock into position by contact with interior side walls of channel when turned at 90 degree. Case hardened channel nuts are also available. Our products are produced as per the requirements of BS6946. A001 M6 X 6 MM A251 1/4" x 1/4"
A002 M8 X 6 MM A252 5/16" x 5/16"
A003 M10 X 8 MM A253 5/16" x 3/8"
A004 M12 X 8 MM A254 3/8" x 3/8"
A060 M12 X 10 MM A255 1/2" x 1/2"
A061 M16 X 12 MM A256 5/8 to 7/8" x 3/8"
A257 5/8 to 7/8" x 7/16"
A258 5/8 to 7/8" x 1/2"
A005 M6 X 6 MM A259 1/4" x 1/4"
A006 M8 X 6 MM A260 5/16" x 5/16"
A007 M10 X 8 MM A261 5/16" x 3/8"
A008 M12 X 8 MM A262 3/8" x 3/8"
A059 M12 X 10 MM A263 1/2" x 1/2"
A009 M6 X 6 MM A264 1/4" x 1/4"
A010 M8 X 6 MM A265 5/16" x 5/16"
A011 M10 X 8 MM A266 5/16" x 3/8"
A012 M12 X 8 MM A267 3/8" x 3/8"
A058 M12 X 10 MM A268 1/2" x 1/2"
A69 5/8 to 7/8" x 3/8"
A70 5/8 to 7/8" x 7/16"
A71 5/8 to 7/8" x 1/2"
A013 M6 X 6 MM A272 1/4" x 1/4"
A014 M8 X 6 MM A273 5/16" x 5/16"
A015 M10 X 8 MM A274 5/16" x 3/8"
A016 M12 X 8 MM A275 3/8" x 3/8"
A057 M12 X 10 MM A276 1/2" x 1/2"